Starting with today's release of the Weekly Petroleum Status Report (WPSR), EIA is now publishing weekly petroleum export and consumption estimates based on near-real-time export data provided by U.S. Customs and Border Protection (Customs). EIA previously relied on weekly export estimates based on monthly official export data published by the U.S. Census Bureau roughly six weeks following the end of each reporting month. This new methodology is expected to improve weekly estimates of petroleum consumption (measured as product supplied) by improving estimates of weekly exports of crude oil, petroleum products, and biofuels, which increased from 1 million barrels per day (b/d) in 2004 to nearly 5 million b/d in 2015. The use of near-real-time export data should reduce differences between EIA's weekly data, as presented in the WPSR, and monthly data, as presented in the Petroleum Supply Monthly (PSM). The monthly data that EIA publishes 60 days after the end of each month are based on EIA's comprehensive monthly survey data and the actual Census Bureau export data for that month. Three of those components are surveyed directly by EIA each week: refinery and blender net production, stocks change (inventories), and imports. 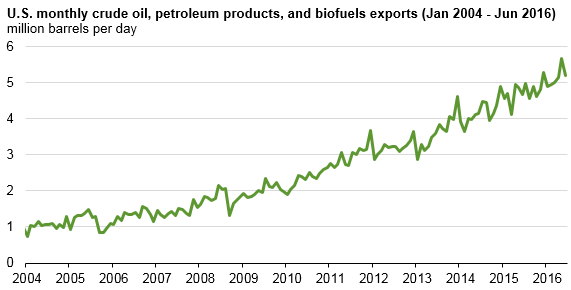 Exports, the remaining component, have become more critical for market assessment and calculation of U.S. consumption of key petroleum products such as gasoline and distillate. 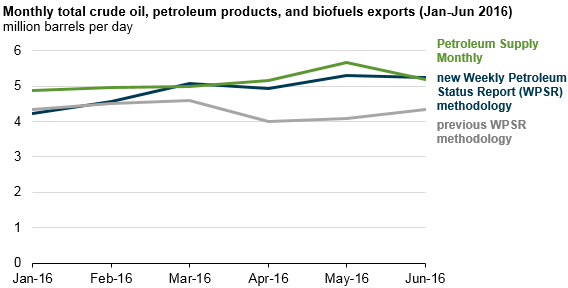 Over the first six months of 2016, EIA weekly estimates underestimated total crude oil, petroleum, and biofuel exports by an average of 16%, compared with final data published in the PSM. This underestimation of exports led to the overestimation of total consumption. The new methodology using near-real-time data from Customs significantly reduces the difference between weekly estimates and the actual data for total exports shown in the PSM during the first half of 2016. This improves both the export and total weekly petroleum consumption estimates found in WPSR Tables 9 and 1, respectively. 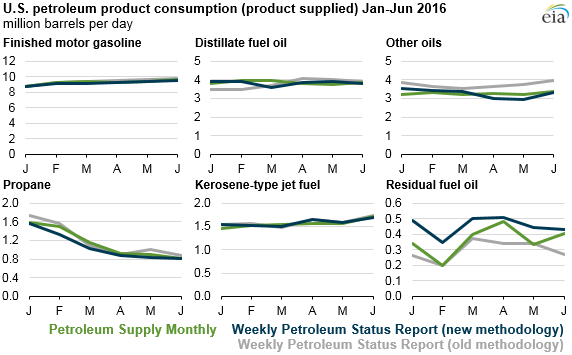 The difference between the old and new weekly methodologies differs across individual products, with the new methodology providing a particularly significant improvement in the estimate of finished motor gasoline exports for the first six months of 2016. The improvement in export values reduces the difference in finished motor gasoline consumption from within 1.3% to within 0.9% of the actual values published in the Petroleum Supply Monthly for the first six months of 2016. While the new weekly export methodology should provide improved weekly petroleum consumption estimates, there still may be differences between the weekly and monthly balances. Although the Census Bureau is able to directly validate data with export filers, EIA processes the raw Customs data without the ability to directly validate reported data with those filers and adds estimates for data not reported by Customs. In addition, there will continue to be minor differences between weekly sampled survey data for the nonexport categories and monthly data because of standard sampling and statistical issues. Historically, these differences have been minor, with the export data being the largest source of disconnect between the two series. More information on the new exports data and methodology can be found in today's edition of This Week in Petroleum.